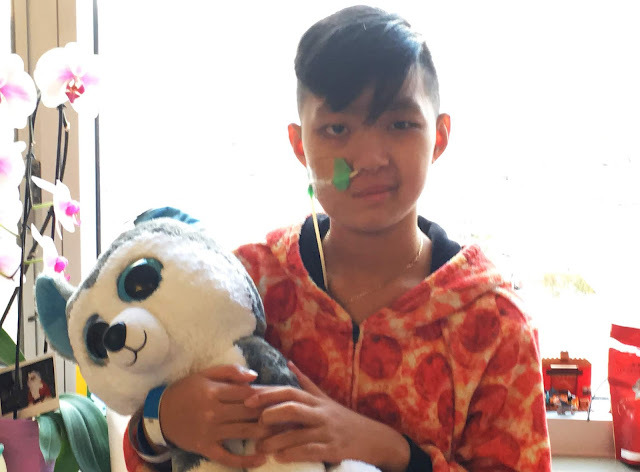 Justin Chau is an 11-year-old inpatient at Holland Bloorview. He's writing a story about his life following a surgery to remove a brain tumour. He loves orange, because it’s the colour of flames, drawing abstract art and camping. We spoke about his story and experiences in hospital. BLOOM: You wrote that when you woke up after your 10-hour surgery, everything felt fake. What do you mean? Justin Chau: I wasn’t aware of where I was, because it didn’t feel real. I wasn’t aware of where I was in space. I felt different in my body. I didn’t feel like my normal self. I felt like it was all a dream in my head. 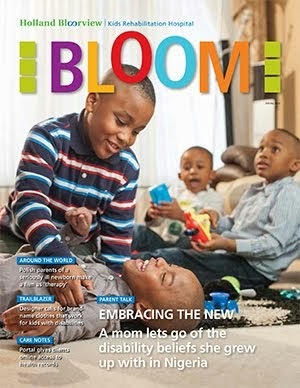 BLOOM: In your story, you say you’ve been able to sleep better since you came to Holland Bloorview. Is that because it’s quieter here? Justin Chau: No. It’s because I do lots of therapy and talk to lots of people and I’ve made friends. I’m not on any medication, I can walk and do stuff better, and I’m independent in my room. Because I’ve been here for longer, I get to know people better. I feel like I’m not alone, because everyone is supporting me. BLOOM: You wrote about one friend you made here, who was a baby. Justin Chau: Yes. My mom made friends with his mom, and one day I got to babysit him for a couple of minutes in my room, while our moms went to do something. He would laugh at me while I do stuff. After that his mom trusted me, so I continued to babysit him. They call us soul brothers, because we both have a scar on the same side of our head. When it was his last night here, I decided to go and play with him. My mom and his mom exchanged numbers so we can talk to each other and meet up in the summer. This is just the beginning of our friendship. BLOOM: You mention a big list of nurses that you like, and say they’ve inspired you to consider nursing as a career. What qualities are important in a nurse? Justin Chau: I think a nurse that always watches over you and that comes in at the right time to check if you need help. They should know my feeding schedule. They should teach me and guide me. Since I want to be a nurse, they taught me to do my own feeds. I like a nurse who's caring, sometimes funny, always positive. BLOOM: Why did you decide to write a story about your experiences? Justin Chau: My social worker, Anna Marie, asked me if I wanted to create a timeline of how far I’ve come, and the progress I’ve made. I was like ‘That’s a good idea, can I write a story?’ It’s important because I want to know how much I’ve been improving, and how quickly and well my body has recovered. BLOOM: Is there anything we can do better here at Holland Bloorview? Justin Chau: I like almost everything here. I think the therapists do a really good job of pushing kids to work harder, so that they improve, but not so hard that we’re exhausted. They push us so that we feel confident and strong. I think this hospital is one of the best that I’ve seen. They have recreation in case you’re bored, and there are lots of things to do. You get a nice room with a TV, and the nurses are always caring for you. And you can go to school here. I have fun going to school. Justin--you are a hero. I was glad to hear that all the nurses are very helpful and supportive to you. Remember, you are not alone, we are a team with you. Good luck to you. On behave of all the B.I.R.T team we all proud of you and your mom. Your mom also a hero too. "Hard enough to improve - not so hard we're exhausted". Justin, I expressed a similar concept to my family when it came to our meat bag. "Hard enough to motivate - not so hard as to be discouraged". And the one of recreation as well. The way you're using narrative therapy is so brilliant. And stories do bring on better sleep, Justin. The feeling of "fake" post-surgery. I want to thank the B.I.R.T team for getting me this far. What would life be like without them? I miss them.I am discharged and was discharged February,7th.2019.I have had an awesome journey at bloorview hospital. I will now wright a second chapter for my story. -Justin Chau [writer of this story/ My unforgettable Journey.